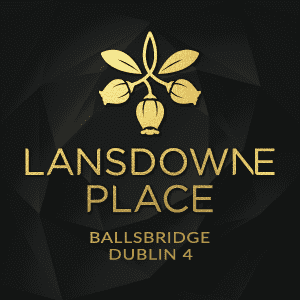 Leading Irish developer Chartered Land is undertaking the global launch of Lansdowne Place, Dublin’s most luxurious residential development, located in the prominent district of Ballsbridge, Dublin 4. Set on the historic site of the former Trinity College Botanical Gardens, Lansdowne Place is a collection of contemporary residential buildings comprising 215 one, two and three-bedroom apartments, including 24 spectacular penthouses. Setting a new standard of living in Ireland, the development has been designed by award-winning architecture practice O’Mahoney Pike, whilst renowned London-based interiors studio Goddard Littlefair deliver the elegant interiors for their first project in Ireland. Ranging in size from 782 sq. ft to 1,910 sq. ft, Lansdowne Place provides some of the largest private apartments in Dublin. Generous ceiling heights of 2.7m (8.85 ft), large floor-to-ceiling windows, sunrooms and balconies combine to create spacious light-filled homes. Bespoke light and dark palettes are available for the interior fit-out, with materials chosen inspired by the local area; a selection of fine stone and natural stones finishes, oak flooring and soft carpeting are thoughtfully crafted in a classic, contemporary setting. Typical units include open-plan living and dining rooms, as well as a kitchen with integrated Miele appliances. The majority of kitchens feature bespoke concealed larders with solid timber drawers, engraved with the Lansdowne Place emblem. Bedroom suites include in-built or walk-in wardrobes. Upper level apartments produce spectacular vistas across Dublin, whilst some enjoy views directly onto the impressive Aviva Stadium (home to the Irish national rugby and football teams) as well as some with breath-taking sea views across the bay. Discussing the interiors at Lansdowne Place, Martin Goddard, Director and Co-Founder of Goddard Littlefair said: “With this being our first project in Ireland and one which carries such prestige, we wanted to establish a project design to create a unique result, which is a fusion of classic proportions and contemporary detailing, with a Dublin edge. Residents benefit from world-class amenities and services at ‘The Lansdowne Residents Club, a purpose-built leisure facility and 24-hour concierge service. Meeting the demands of even the most demanding lifestyles, the Residents’ Club, spaced across two floors, provides a classically-designed lounge, library, meeting room, cinema room, private dining room with separate kitchen, as well as a terraced area. The lower ground floor comprises a full-service spa, comprising a gymnasium, fitness studio sauna, steam room and individual treatment rooms. The parking facility is located in the basement, which is accessible from street level. The dedicated concierge, supported by full-time staff maintaining the leisure and entertainment facilities, will ensure that residents receive 5-star service on a daily basis. Ivan Gaine, Managing Director at joint agents, Sherry FitzGerald New Homes, added: “Lansdowne Place is the jewel in the crown of the Dublin residential market and since launching to the local market, i June 2017, has achieved over €100 million of sales, all of which have been off-plan. One of the standout sales was the exchange of a €6.5 million penthouse in the Blake Building, which set a new record for a private sale apartment in Dublin. Positioned behind the original railings iconic to Lansdowne Road, Lansdowne Place is divided into seven beautifully designed and luxuriously appointed residential buildings overlooking landscaped gardens. Respecting the character of the area and long history of the site, the use of traditional materials mirrors the elegant Victorian houses that fill the peaceful tree-lined streets of Ballsbridge. One of the most important aspects of Lansdowne Place is the landscaping, which includes garden squares, feature planting, landscaped lawns, seating areas and a water feature, as well as a children’s play area. A number of trees and plants are original specimens retained and preserved from the original Botanic Gardens that were present on the site for 150 years. One exceptionally rare specimen present at Lansdowne Place is a Strawberry Tree, which has been recognised as one of the great trees of the country and protected by the Tree Register of Ireland. The development itself pays further homage to the history of the site, with the individual buildings named after former prominent botanists of Trinity College. On the south side of Ireland’s capital city, lies Ballsbridge, Dublin 4. An exceptional and unique area, currently in the midst of a rejuvenation programme, spearheaded by Chartered Land, which alongside Lansdowne Place is delivering a new luxury hotel and village quarter. Renowned for its mix of prestigious corporate office buildings and embassies, Ballsbridge is just 10 minutes from Dublin city centre and a 20-minute drive from Dublin International Airport. The area is also best known as being the home of the impressive AVIVA Stadium and the Royal Dublin Society Show Grounds which hosts the internationally renowned Dublin Horse Show. For those that enjoy the natural elements that Ireland has to offer, the Irish Coast and its stretch of scenic natural beaches, as well as some of the city’s many prestigious yacht clubs, are just 20 minutes away, with Wicklow Mountains National Park a one-hour drive and Sandymount Beach only five minutes away. This article originally appeared in Luxury Living, 29th May 2018.